Increasing automation and the associated boost to flexibility no longer means that you have to neglect risks at ports and terminals. Port operators all over the world are always on the lookout for a solution that strikes a balance between these two areas. What they need is the support offered by SICK’s sensors and systems. Container ships are loaded and unloaded, cranes, straddle carriers, and other means of transportation move containers between the terminals. Sensors have to be able to react flexibly to a wide range of applications, such as an assortment of different sensing ranges, weather conditions, vehicles, and profiles, to name but a few. As well as precise positioning, systems also need to be able to measure dimensions, contours, speeds, and distances. 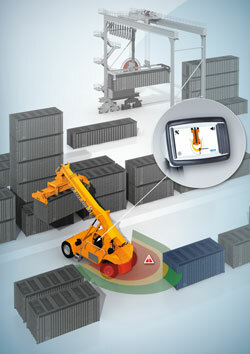 Sensors identify the position of containers and detect bulk materials that have to be picked up by cranes. They plot the ideal transport path for a traveling crane to help save time. They secure access to platforms, ensuring that dangerous movements are stopped when a person enters the area. The sensors also monitor automated guided vehicles and people and objects in the vicinity of moving vehicles. 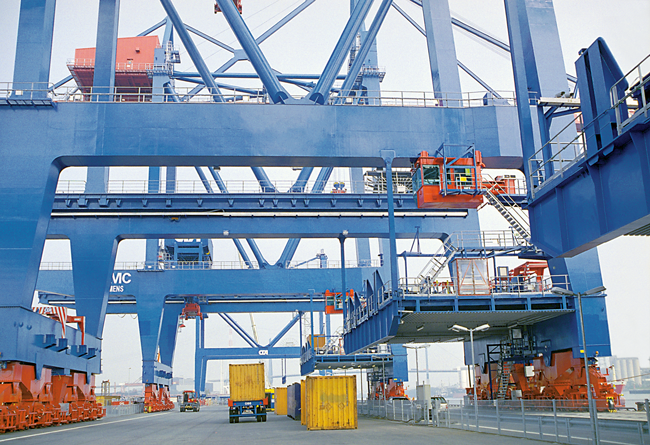 They provide assistance for the drivers of reach stackers and empty container handlers. Some areas of the vehicle are not visible to the driver. The greatest danger is posed by the dynamic movement of the vehicle’s tail end, which can be attributed to the real-wheel steering and the incredibly narrow turning circle. The sensors help prevent accidents and collisions by warning the driver or issuing a stop command. YILPORT Holding, a Turkish terminal operator that operates internationally, is always looking for ways to improve workflows and increase safety for its staff. During its search, the company came across SICK’s RAS Prime collision awareness system. The system had to pass tough tests under extremely harsh ambient conditions, such as thick fog, dust, and other weather conditions. YILPORT was impressed by the level of reliability and simple operation of the system. RAS Prime permanently monitors the area behind a reach stacker. As soon as an obstacle enters one of the three preconfigured warning zones, RAS Prime emits visual and audible signals to tell the driver that this warning zone has been violated. The distance and warning function can be relied upon to support the driver during reversing. However, the RAS Prime shows its true potential when maneuvering in narrow locations where visibility is poor. Due to the rear-axle steering, the tall end of a reach stacker swings out at extreme angles. Constant monitoring of the area to the rear of the vehicle gives drivers previously unachievable levels of freedom in safe maneuvering. They do not need to turn their heads, as they are kept fully informed by the display and alarms in the cab. This is even true at night, as the display features a special night mode.